Dalkey is a beautiful seaside village on the east coast of Ireland about eight miles south of Dublin and has always been a favoured family resort. As a youngster we lived close enough to pack up Dad’s car and head off, stopping at a shimmering golden beach we called ‘Simon Templar Bay’ to watch speed boats buzzing about on sparkling seas while mom sipped a glass of wine and dad enjoyed a Guinness ‒ happy days. 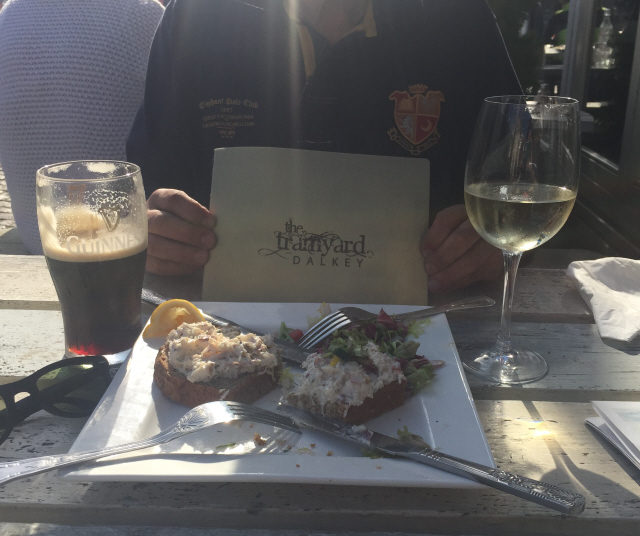 It’s still a regular stopping point for us; the little artisan market set in the Tramyard, with the @TramyardDalkey ‒ all ramshackle loveliness and delicious grub and @FinnegansDalkey ‒ to watch rugby and enjoy a pint or two,. There are bookshops and art shops to browse and long chats with shopkeepers result in buying far more than we can eat before we’ve to return to the UK. This time, visiting for a special family birthday, we trundled out on the DART on a glorious September day to conduct a bit of research for That Summer at the Seahorse Hotel. 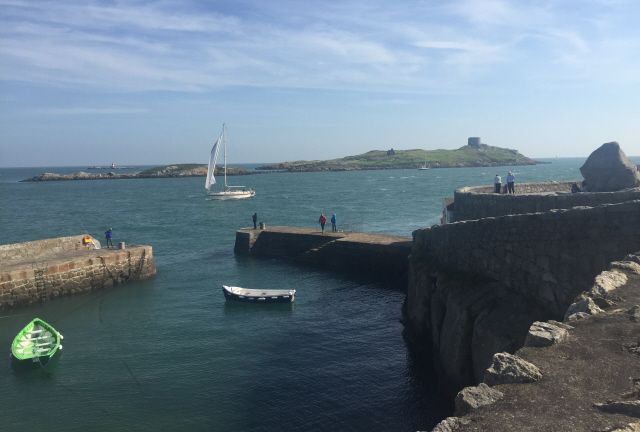 We took pictures of Dalkey Island, the inspiration for Phoenix Island in the book and ate a scrumptious local crab salad, very like the one served at the Harbour Spa Hotel, also featured in the new novel. To ‘seal the deal’ as we say, my lovely husband presented me with a copy of Nights of Rain and Stars by the fabulous Maeve Binchy – Dalkey was her home – more than enough inspiration to finish what (we hope) will be my new best seller!